Below is an appeal from Miranda Sampson from the Mount Saint Joseph library in Mandeville which burned down a few weeks ago. Books are badly needed, especially children’s books. 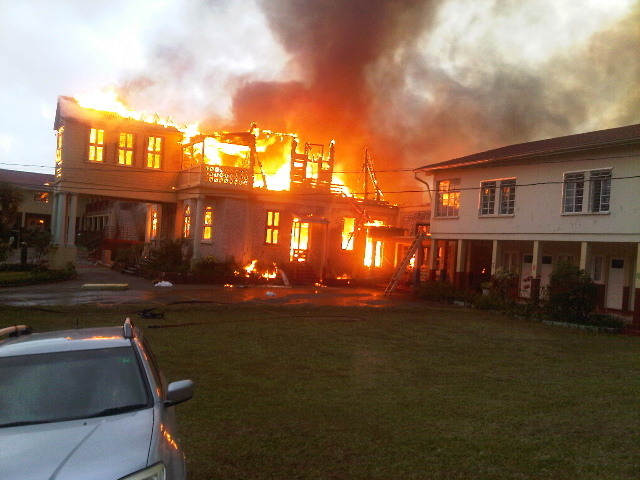 If you can help please email me at karin@kwjamaica.com. For those of you who have not heard, on Saturday February 25th a massive fire destroyed portions of our school. Mt. St. Joseph Prep is a Catholic school that was originally established by the Sisters of Mercy in the 1930’s. It is a very modest school that functions only on very low tuition fees. In 2009 I began volunteering in the library helping the librarian with various reading programs. The more involved I became was the more I realized what a great need the library had for better, more interesting books. Most students I came in contact with viewed reading as mandatory as opposed to a chosen pastime. The same year, myself, along with my family organized a book drive in Tennessee that collected almost 4,000 books. They were shipped to Jamaica, delivered to our school and received by all 500 students with great excitement. In September of 2010 I was offered the job of librarian (and the art teacher) as the teacher was unable to return to work. What began as a temporary position has turned into a serious desire to impact the life of these students through reading. 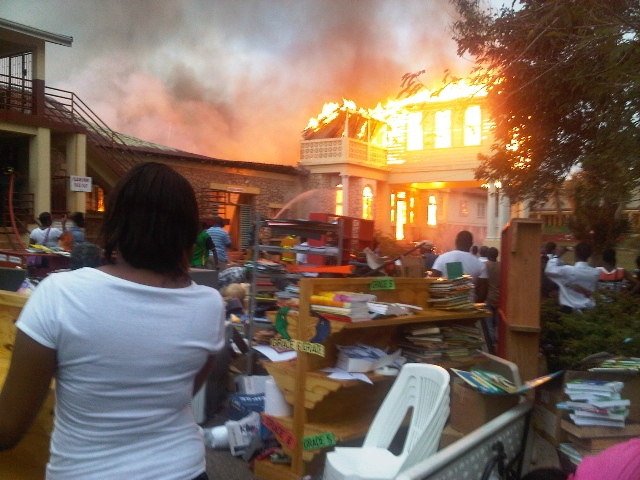 Unfortunately the fire claimed the most expensive parts of the school including the entire computer lab, two kinder classrooms, 4 store rooms, 4 residences (one of which housed a teacher and her daughter), and of course, my beautiful library. We were able to save some books, but as you can see from the pictures above there were many books lost to not only fire, but water damage. So, if you received this email it is because I believe you might feel our pain. I had an overwhelming response of people willing to support our first book drive and I am determined to make this time around even bigger and better. If you are interested in helping either by book donation or monetary donation (no matter how big or small) please contact me or if you are in TN my parents house will be a drop off for books. Currently all three of my children attend this school and while I am still teaching art classes to grades 1-5, I am now coordinating the rebuilding efforts. I believe in this school and everything it stands for. Please join my cause. off latest and earlier technologies, it’s amazing article. 80% of the arguments. A common phrase such as “first-time home buyer” could become “First-Time Home Wrecker”. What I use is sodtware callesd Pro – Tools almost exclusively. Stained, yellow and discolored teeth make you feel embarrassed. amazed aat what can now be done to improve their dental healt and smile. rather they could ork on aking the whole experience memorable. Get down on their level – see the world as they ssee it – you will be rewarded with some interesting pictures. it is the best gaming laptop within limited budget. You should be able to change the future progression of reality according to what will do well for you, in readiness the positive results you wish. Small items like these actually set League besides it is actually rivals. guide throughout the sport to alert your teamates of enemy champion positions, missing champions from a lane, in order to setup a gank. To cover the complete home place the the router inside the middle with the house, try not excessive obstacles between your router along with the clients. fun and entertaining to try out. possesses had some good games along with his latest team. This would assist you to appreciate the action in a holistic way. work aand reporting! Keep up the wonderful wprks guys I’ve yyou guys to blogroll. Jamaica has forgotten it’s authors past and present. to Walk with Dignity-The TRUE story of a Jamaican-born Canadian”2008. Jamaica needs more writers, so check these books out on the internet. Oh my goodness I am so very sorry for your lost. How horrible. I hope that no one was hurt. I know that your hearts must be breaking right now, but something good has to come out of this. Something bigger and better for sure. I will look to see what we can gather and send. Please let us know where we can send donations and books. We will be keeping you all in our thoughts and prayers. Thanks so much Aliona!! I am sure they will be treasured by the children who get them! I would like to send a donation of childrens books. They are my sons most prized possessions but he can afford to part with some of them. I will send an email to Karin. So sorry to read about this fire! I will be in touch re: bringing more books when I come back to JA.